Amber is one of the world's most treasures: the transparent substance looks like a gem, but it is not completely of the earth as gems are. Amber began its existence as resin that often trapped insects, then over millions of years, the substance, with the insects still trapped inside, became fossilized. Prized for its beauty as well as its scientific interest, amber enhances its value by preserving an instant in time from millions of years ago. Simojovel, Chiapas, is one of the world's top three sites for the most sought amber (the other two are Santo Domingo in the Dominican Republic, and, broadly, the coast of the Baltic sea). Chiapas is the southernmost state in Mexico and runs along the border with Guatemala. Simojovel amber is clear with colors ranging from a bright golden color to blood-red. Simojovel amber is well known for the primeval insects found locked within it. The amber and its insects date from the late Oligocene to Early Miocene epochs, 23 to 30 million years ago. Mayan artifacts often include amber, and in the latter days of the Mayan culture, many of these artifacts were paid to the Aztecs in tribute. Scientists say amber is the petrified resin of trees. Resin should not be confused with sap, which is "the blood" of trees that circulates through the a tree to circulate the nutrients derived from the soil by the roots as well as the sweet products of photosynthesis from the leaves. Resin, meanwhile, serves no purpose in the distribution of nutrition through trees. It seeps out the surfaces of certain trees like pine trees. Yet even scientists do not know what purpose these divine tears of solar godesses serve. On rare occasion, resin falls into a place in nature deep in the earth. High pressure and temperatures modify the resin molecularly so they form long chains or polymers—in other words fossilized amber becomes a substance much like a hard and enduring plastic. It's important to remember that although amber is a fossil, it doesn't have the durability of stone fossils. Amber will dissolve in in alcohol, ether and chloroform, and heated above 200 degrees C., it will produce an oil of amber and a black residue called amber pitch. It can also be dissolved in turpentine or linseed oil to produce amber varnish. The oldest amber dates from the Upper Carboniferous period, 320 million years ago, and the more common forms date from the Cretaceous period, 150 million years ago. This latter form often contains insects and preserves soft parts that would not be preserved by ordinary fossilization. 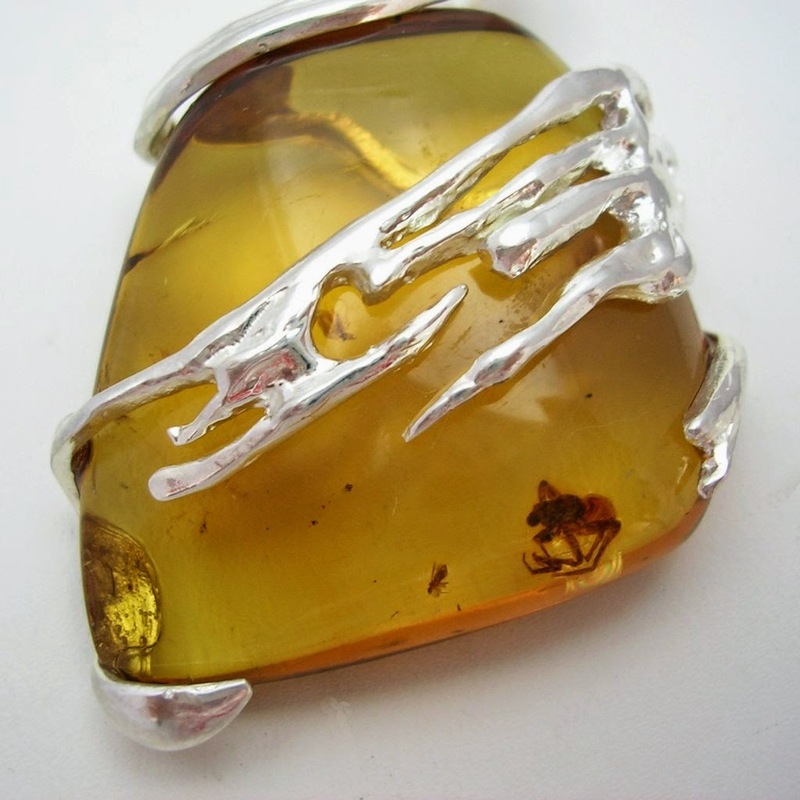 In terms of market value, scientific interest, intellectual curiosity, and simple adornment purposes, amber with insects has the greatest value. For the past 13,000 years—since cave man days—amber has been used as jewelry. 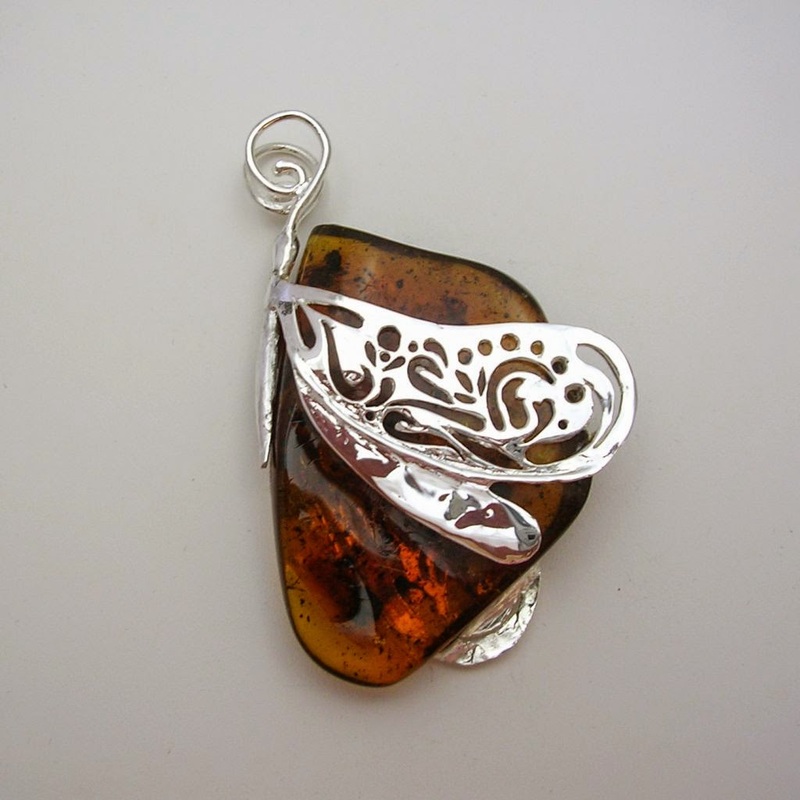 Polished stones made from amber are often mounted in sterling silver to produce beautiful pieces. Those with insects visible in the amber have especially good financial as well as conversation-starting value, so they have settings of corresponding value as well. The ancient Greeks concocted a delightful but sad myth to explain amber. Phaeton was the son of Helios, the Sun. One day ambitious Phaeton persuades doting Helios to allow him to drive the chariot of the sun across the sky. But Phaeton is too young to control the solar chariot, and he loses control of the powerful horses pulling the chariot, and before he can crash into the earth and cause great damage, Zeus zaps him with a thunderbolt. The mourning of Phaeton's sisters transforms them into poplar trees, and their tears become the precious substance electrum, meaning "beaming sun," which was the Greek phrase for what we call amber—the joy of sunlight wrought, through tears of pain, as a precious substance. Yet beyond its scientific, social, and adornment value, amber might well have a spiritual value as well. You might not believe in Helios, spoiled Phaeton, and the tears that Phaeton's sisters cried, but that beautiful piece of jewelry around your neck links you to over a hundred million years of the history of life on earth. Or perhaps you will simply take great pleasure in owning a piece of beautiful and valuable amber. If you'd like to see some samples of this amazing fossils, visit Mexico Sterling where Taxco silver and Simojovel amber jewelry is displayed with the most unique and artistic artisan designs.